Is Microsoft planning to unveil an Android powered phone soon? Even though the Surface Phone has apparently been put on hold until late next year, it doesn't mean that the guys in Redmond won't have a brand new handset to sell this year. According to a report published today, a Microsoft Store rep said during a chat that the software giant is working on a new Android powered phone. And as much as we'd like to just call this "fake news" and move on, we can't for one reason; a Microsoft branded Android phone actually makes sense. However, while it is possible that the rep did hear something, they are often the last to know about new products. And reps who work inside a carrier branded retail store are usually so focused on earning commissions from the hardware available in the store at that moment, that they really don't care about the new handsets, tablets and wearables in the wireless provider's pipeline. Even though a Microsoft branded Android phone is possible, and makes sense, outside of the word of one Microsoft Store rep, there have been no other clues or hints (even from the supply chain gurus who usually pick up on unusual activity) that such a device is coming. So for now, we would suggest that you take this report with a grain of salt. Well, chances of they releasing a Android based smartphone are bigger than the Surface phone that running Windows based OS, since they had a lot of apps that is available for Android. I'd love to see what Microsoft would come up with for an Android powered phone series. Make it worthy competition for Motorola and Nokia, don't bother going after Samsung and Apple unless you've got something pretty damn special in mind. 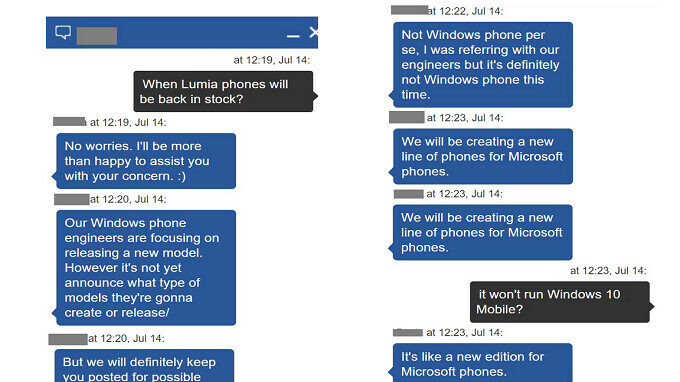 The Nokia phones today are still Microsofts. Because Microsoft still holds all the intellectual property from the purchase of Nokia. I will get one if it doesn't have any traits of their ill-fated windows phones. Seriously ? If they had to do this at the end of the day, who will explain the deathblow they served to Nokia ? Pathetic strategy by Microsoft. Not only killed their own chances in smartphone market but also took down mammoth Nokia with it. Nah bring back windows phone and FFS do it right. Who ever said they can't do both? Release a Windows-flavored Android with all the Microsoft enhancements and apps for general consumers and the Andromeda device for those of us who want or need one. They would not compete against each other since Andromeda is Windows-On-Arm as opposed to a mobile OS like Android. Of course it's gonna be Android. Look at how much work they put into the Microsoft Launcher for Android. That tells you right there. Be on the look out for the Microsoft Lumia Droid sometime next year. No... please no..... Just refine your OS and make a Windows phone with a nice app ecosystem. Haha,,,,to late already,,,,,same boring mediocre phone! Microsoft should forget phones permanently and just stick to software. I'm looking forward to see an MS Android-powered phone with a Pureview and Clearback in the market again.